In an effort to take my personal fitness and overall health to the next level, I have joined in on a challenge hosted by certified trainer Rob Booker, owner of Temple Fitness. The “See. Believe. Pursue Challenge” is a six-week challenge replete with diet and exercise regimen. This is the first week of the challenge and challenging it is, as each participant is encouraged to participate in a 7-day, no-meat, no-carb detox! Whew! It has been great so far (even though I have had some weak moments). What has been great about this detox is that I’ve had the opportunity to get a little creative with vegetarian recipes outside of the normal salad, for example. The recipe I’ve decided to share with you all took me all of 20 minutes to prepare and plate. I did an evening grocery run to get the ingredients so I did not have much energy to spare after that. How do I know this recipe is a keeper even beyond the challenge? Because I wasn’t completely tuckered out after the meal was ready! A great thing about this meal is that it is also family-friendly. Kids can make their taco wraps just like they want. Plus, substituting sour cream from plain Greek yogurt adds protein to your diet! I love this substitution and can barely taste the difference between the two. You won’t even miss the sour cream 🙂 Hope you guys enjoy! Add all bell pepper, jalapeno, and onion. Cook until they begin to caramelize and brown, about 10 minutes. Put drained beans in medium saucepan. Add water, balsamic vinegar and all seasonings. Stir and bring to a boil. Reduce heat to a simmer and let cook 7 minutes. Add Gardein beefless ground. Stir and let simmer for 3 minutes. Cut off bottom white stems of lettuce and fill with bean mixture. Top with avocado, tomato, salsa, and Greek yogurt for sour cream. 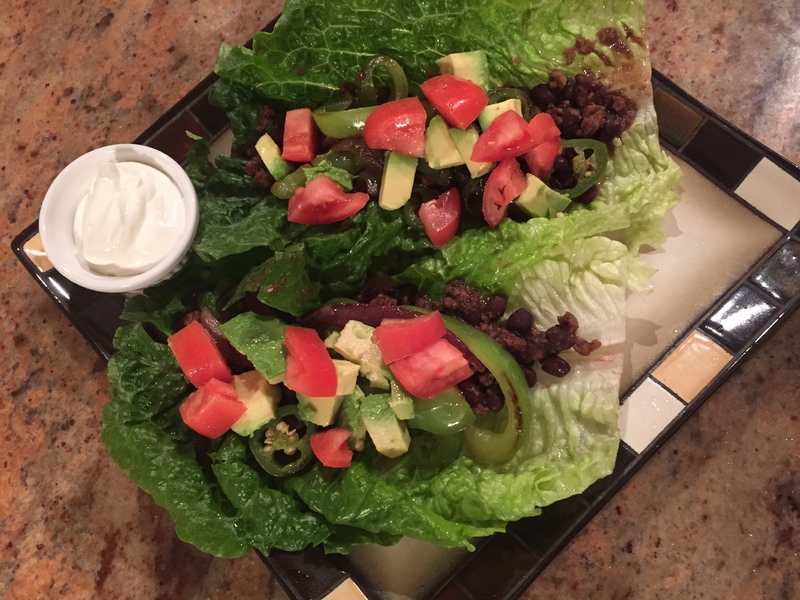 This recipe looks delicious and so healthy– I love taco wraps!! This soon! I needed some new recipes to incorporate to my healthy diet! Gotta get this weight off!